I HATE cutting up onions. I always have had sensitive eyes and onion cutting has been just plain old fashioned sucked. I’m the girl who won’t touch eye drops because the stinging pain is just too much for me to handle. I have seriously, stupidly sensitive eyes. I’ve tried a few things, like wearing glasses while getting chop happy. Not always working. Cold onion? Doesn’t matter. I remember when I watched The Help and she said to hold a match between your teeth while cutting an onion, I wanted to run and get a notepad. I haven’t tried it since we don’t keep matches around the house. BUT I did hear about another thing to try. Simply, light a candle. The flame pulls the gas that the onion emits while being cut. It no longer dances up to your pretty eyes. 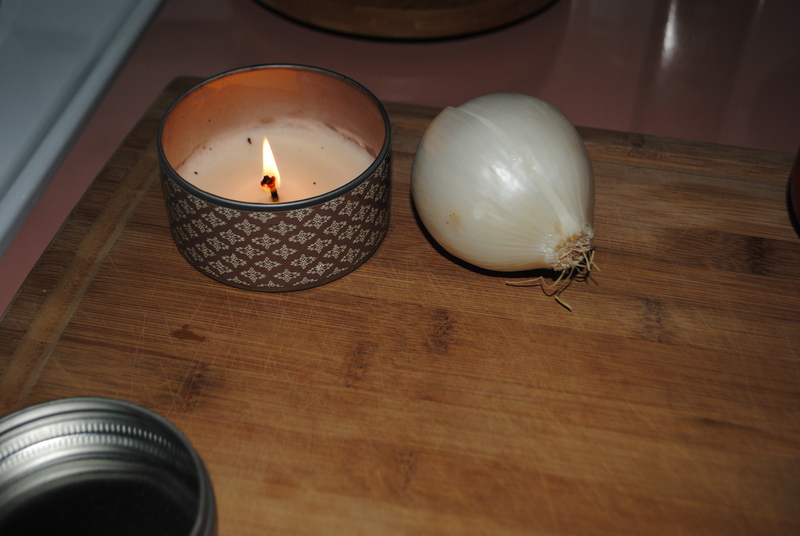 You, of course, want to keep the candle as close to the onion as you can comfortably manage. You no longer finish cutting your onion, believing you have magically dodged the onion bullet and then 10 seconds later you are grasping the counter and drowning in your tears. Sometimes I still get a little tickle in the eyeball but it’s definitely not as close to the pain I would have before. I haven’t been updating very often because I have been trying to get back to balancing life after my in-laws left. It’s always a hard adjustment because the baby wants to hang on me all day and wants every ounce of my attention, while I am back to being a taxi cab and personal servant. ALSO, I have started exercising again!! I am on day 4 of bodyrocking. I followed them for about 2 months earlier this year, before Mr McDorkins became sick and was hospitalized, at which point I didn’t work out because I just couldn’t. Now, though, I am back to it. Last time I successfully lost inches like a mad lady and built so much muscle, I felt Herculean!! This entry was posted in Food, Health and tagged bodyrock, flame, onion, tip, trick by themcdorkins. Bookmark the permalink. Seriously trying this. I’m blind as a bat without my glasses so cutting onions with the goggles it tricky!